Our Company is Following a Cost leadership Strategy. Providing a high quality together with a low price. Hence, we are sure that our brushes will reduce client costs enhancing their competitiveness. However, we are maintaining a high quality using the best bristle within the market. Because our company has the manufacturing capabilities to make large dynamically balanced high speed brushes (1800 rpm) the abrasive Sueding brush for textiles has become a perfect fit. Sueding brushes demand a full, dense pattern across the face of the entire core .our brushes have the maximum bristle per square inch incorporated into design. The nylon abrasive brushes were designed to satisfy the increasing demand for a softer hand on knit fabrics. The Brush roller is manufactured on Proven High-Tech Imported European Machine . 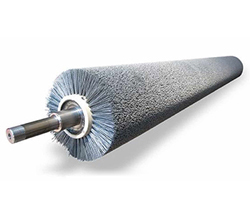 The Brush roller is manufactured by Imported Silicon Abrasive Monofilament (Carbon OR Ceramic Bristles). Uniform surface is obtain be special imported Grinding/Trimming Machine. Guaranteed High Density Pattern which Gives Immense Result on Fabric Surface. Re-Trimming and Re- Grinding Service Available for Worn Out Brush Roller. In House Production Facility for complete Manufacturing of Brushes. Since many years Brush India’s Brush Roller for Sueding Machine have been supplied with success into the textile industry to improve a higher surface quality of Knitted and Woven Fabrics. The brush process is an economical and technique in improving surface Properties . Core Roller: - The Core Roller is manufactured From M.S. Seamless pipe of high thickness and it is thoroughly turned for uniform diameter. and Dynamically Balanced . 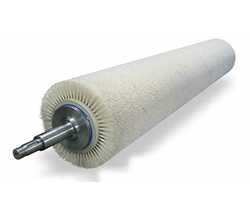 Shaft journal: - The Shaft Journal of brush roller is manufactured by using En-8 Material as per OEM’s and Customer standard and preventive care is taken during manufacturing process. Brush Manufacturing:- The Brush Roller is manufactured on High-Tech Imported European Machine for Accurate Quality Result and Satisfaction. Balancing: - Brush Roller is Dynamically Balanced for high R.P.M at two Stage, Fist After completing Shell and Second After Brush Manufacturing. Certificate of the Balancing is issued to party. Finishing/Trimming: - The Trimming / Finishing is done on Imported European Machine for accurate and uniform Surface finish of Brush roller. Certificate: - The Certificate of Balancing is issued to the Client.